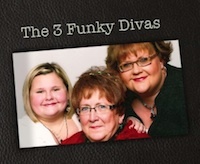 I’m sure many of you have been wondering where the Divas have gone. . . with no current blogging going on, I was wondering myself. . . we have been sooooo busy writing and creating! And… we have been redesigning our site and blog. We no longer will have a shopping cart on our Website; we will be using our new site to showcase our designs and keep all of our followers informed as to what we are doing. We are going to use our ETSY Storefront exclusively for all ordering but will still offer the convenience of paying with Visa, Mastercard, or Discover cards through PayPal. Keep watching for our updates over the coming weeks.